Every turn you must choose a role to execute and in doing so you will add one of those Role cards to your deck. When executing a role, you may Boost its effect by playing cards out of your hand matching the role you have chosen. For example, the more research done by your empire, the better your empire gets at doing research - because there will be more research cards in your deck! 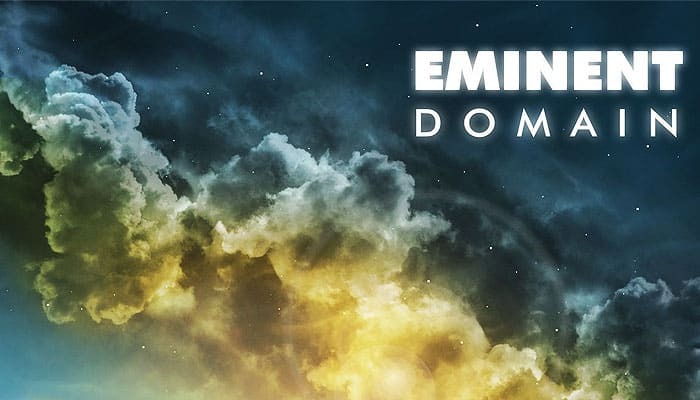 During the game players gain influence throughout the universe by expanding their empire, doing research, and trading. You'll Survey to find planets, Colonize them or use Warfare to incorporate them into your empire (flip them over) and gain access to their abilities and influence, Produce resources on the flipped planets to Trade, and study these planets to Research new technologies. The player whose empire has the most influence at the end of the game will rule the galaxy! Deal each player 1 Politics card. Remove any unused Politics cards from the game. Separate the other Role cards by type and put them face up in 5 Stacks on their respective spaces on the central card display. These are the Role Stacks. Randomly deal each player a Start Planet tile which they put FACE DOWN (survey side showing) in their Empire. Remove unused Start Planets from the game. Shuffle the Planet cards and place them in a face down draw deck on the side of the central card display. Randomly deal 1 Player Aid tile to each player . Whoever receives the Player Aid with "Start Player" on the back will play first. Remove unused Player Aids from the game. 8 Influence tokens are marked differently than the rest. Set those aside leaving 24 in the supply. Separate the Technology cards by type into three FACE UP piles placed to one side of the central card display . These piles are freely accessible to all players at all times. Draw 5 cards from your deck and you're ready to begin! Some players can be overwhelmed by the number of Technology cards when learning the game. For your first game you might consider using the Learning Game described in the Variants section to help teach the game. Play one card from your hand and resolve its Action effect. Actions cannot be Boosted or Followed. You may choose to play no Action and skip the Action Phase. After executing the Action, place the card played into your discard pile. Lead one of the 6 roles: Colonize, Research, Produce, Trade, Survey, or Warfare, and resolve its Role effect. Choose a Role from the Central Display. Take a card from that Stack (if available) and place it in your play area. You may Boost the chosen role by playing any number of cards from your hand with symbols matching that role. Symbols on face up planets in your Empire may also be used to Boost the Role. Cards played during the Action Phase do not contribute to Boosting the Role. Resolve the Role effect, including the Leader bonus, taking into account all symbols used to Boost the role. Dissent: Draw 1 card from their deck to their hand. Follow: Play cards from their hand bearing symbols matching the chosen role and execute the role effect (not the Leader bonus). Symbols on face up planets in their Empire may also be used to Follow the role. Note that you can Follow a role without playing any cards from your hand, using only symbols in your Empire. A role may still be chosen when its stack is empty. In that case, Trade, Produce, and Research have an additional Leader bonus. 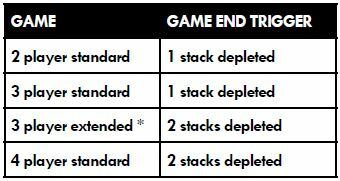 That bonus only applies when the stack is empty! Discard played cards and reconcile your hand. Each player places cards they played during the Role Phase (except those tucked under planets as Colonies) into their respective discard piles. You may discard any number of cards from your hand, keeping the rest. Draw or discard cards until you reach your Hand Limit. You only reconcile your hand during your own Cleanup Phase, never on an opponent's turn. The base Hand Limit is 5 cards, though it can be modified by planets in your Empire. Discard piles are open information and may be examined at anytime. The game end is triggered when either the Influence supply OR a number of Role card Stacks are exhausted. After this occurs, the game will end as soon as all players have taken an equal number of turns. The player sitting on the start player's right will therefore take the last turn of the game. 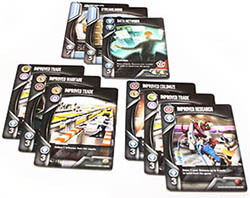 If the Influence supply runs out, players still receive Influence tokens they are entitled to - use the 8 set aside Influence tokens and spare Resource or Fighter tokens if need be. 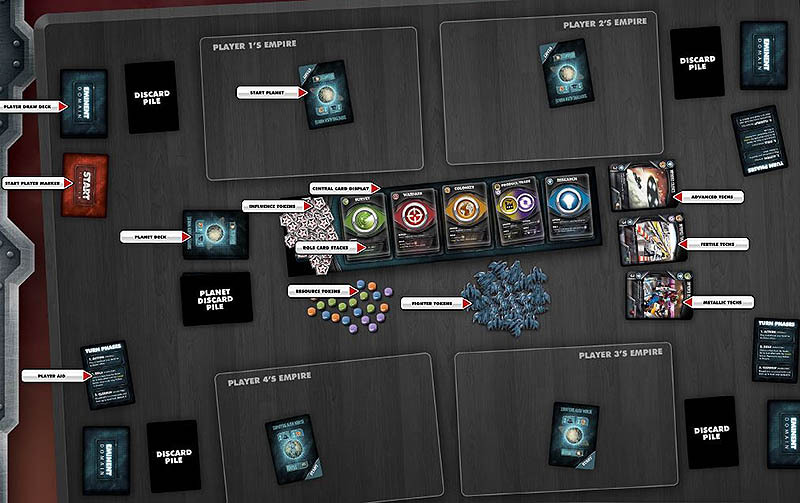 Add the Influence from your Influence tokens, Technology cards and face up Planet cards to determine your score. The player with the highest score wins. In case of a tie, the tied player with the most Resource and Fighter tokens in their Empire is the winner. In case of a further tie, play another game to determine the victor! It can be overwhelming to take in all of the Technology cards while trying to learn the game. Some players may prefer to play with this Learning Game variant to make it easier to understand how to play. 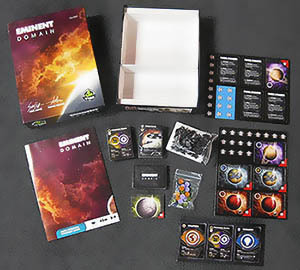 Remove the Technology cards from the game, as well as the 3 Advanced planets with Research symbols. Turn the Research role Stack face down; it will not be used. The Learning Game is played exactly the same as the regular game, but without the Research role. To further ease into the game, you may choose to add only the Level 1 Technologies in your second game, leaving the Level 2 and Level 3 Technologies for after you see how the Research role works. For those who prefer a longer 3-player game, this variant will increase the game length. Remove 2 of each Role card (only 1 Warfare) from the Stacks during Setup. Play until the Influence supply or any two Role Stacks are exhausted.